This writing sample was created by a 4 year old. When asked what she wrote, the author said "I love you, Daddy!" 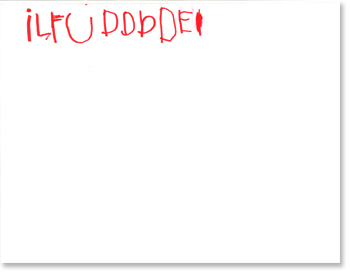 This long string of letters shows us that the author is working to match sounds to letters. The E at the end of the sample is evidence that the student is listening to whole words and mapping letters to all the sounds she hears. 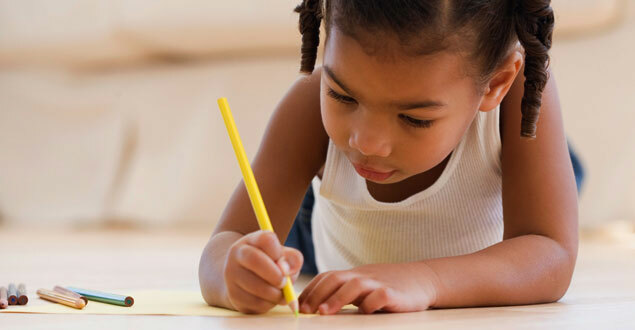 Adults can nurture the development of a concept of word by pointing to individual words while reading and by drawing lines for individual words within writing samples. Taking dictation, or printing the words your child dictates, demonstrates writing, directionality, and letter/sound correspondence. From our classroom strategy library, see Concept of word games. Punctuation is another milestone for this writer. One way to nurture the development of correct punctuation usage is to point out punctuation in books as they're being shared. Point out the period and tell your child authors use those to let us know that is the end of a thought. Point out exclamation points (kids love to call them excitement marks!) and question marks. Your young writer will begin adding these to writing samples.